Describe systems and subsystems so that no knowledge of its implementation is necessary. At a minimum, you need to describe the behavior of interfaces of the subsystem. More complex systems benefit of a clear functional description. If not done right, the structure can create more problems, "get in the way"
Without a proper tie-back to customer requirements, the purpose can get lost. If you are using a formal modeling language (SysML, UML), not all stakeholders may be willing/capabile to understanding the model. One-Pager: If you work with documents, create the key information of the system on a single page, outlining the structural elements. Think of a product description in a technical catalog. 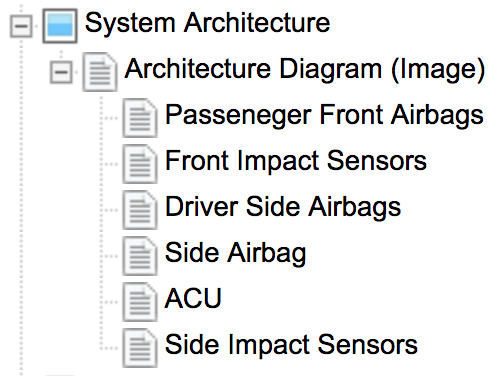 In a modern requirements tool, structures can be used to guide the breaking down of the system into subsystems or components that will then be treated like black boxes (see image). This requires skilled authors that ensure that the description is problem-oriented. The items can then have down-stream traceability to the design. In software systems, consider building a domain model using classes.